For a couple weeks I'd managed to misplace the bag that my Springtastic Socks are hanging out in, which wasn't so bad, considering I have a million and five other projects I've been juggling. But now there's less than a month left in the Holla Knits KAL, and I really ought to be working on them, and that's when I was struck with the reality of how lost that project bag was. As you can see by the picture up there, I did manage to find the elusive bag, and I plowed through the remaining gusset decreases on sock #1 during my lunch break yesterday. I'm hoping to get these mostly powered through before my knitting retreat in two weeks, but we'll see how much I can handle. I went down a needle size from my usual, and my hands aren't quite used to the smaller needles yet, but I'm really excited to see how these turn out. This has happened to me also. 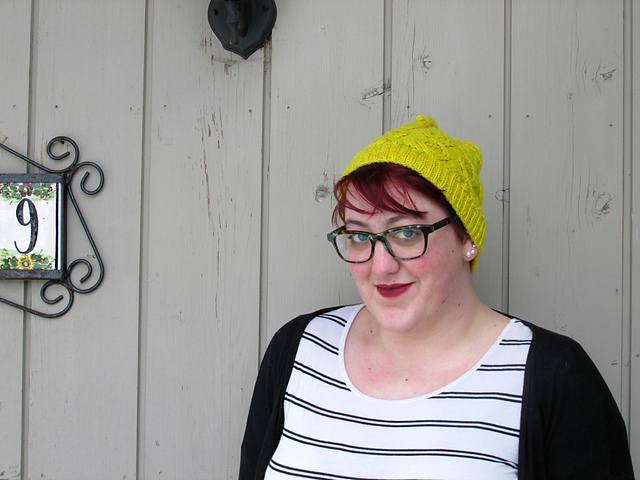 For ages I couldn't find this camel/cashmere beanie I had worked on at Stitch 'n Pitch. Then when we moved, I actually found it. I frogged the beanie to knit a Susan B. Anderson shawl but that languished for a while and then it got frogged when I realized I wouldn't have enough yarn. Glad you managed to find these socks again, they're very cute. Good luck finishing them in time for the KAL!